civil war – What's Cookin' @ Special Collections?! 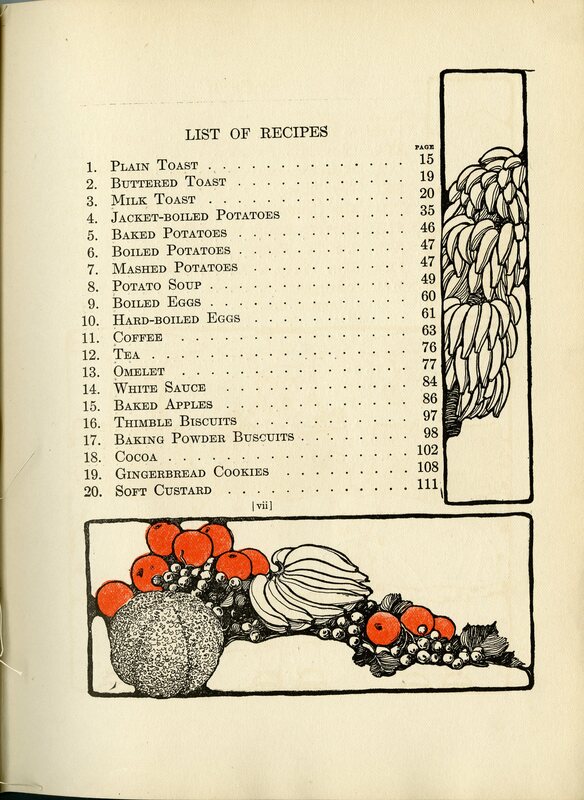 In our last episode (aka, Women’s History Month, Part 14), we looked at the Eliza Leslie, cookbook and fiction writer. This week, we’re picking up with that trend. 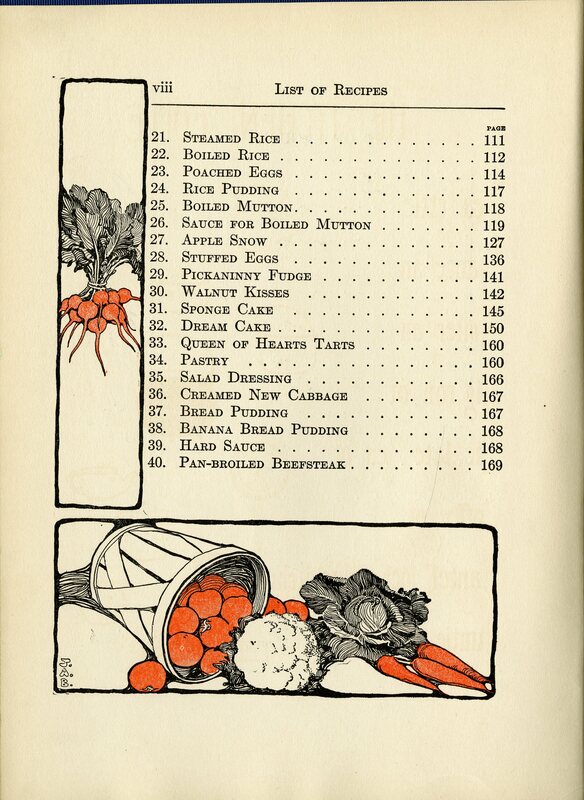 Eliza Leslie was not the only cookbook author who wrote in multiple genres and who started in a different format first. This week, we’re featuring Lydia Maria Francis Child (1802-1880). She started out writing history, moved into household management/cooking, and then expanded even further, producing stories, poetry, novels, abolitionist tracts, and materials for children. Both during her life and after her death, her letters were also published. The volume of writing she produced goes well beyond the bibliography of books available here (see below). While I won’t make any attempt to reproduce her entire life here (I’ve included links to some biographical resources below), there are some interesting things to point out about Lydia Maria Francis Child, including some interesting ties to food. Her father, David, was a baker. After her mother’s death, she lived with her sister and was educated to be a teacher, a profession she took up by 1821 in Massachusetts (where she met the Transcendentalist movement). Her first novel was published in 1824–she was 22. In 1828, she marred David Lee Child, a lawyer who, among other things, introduced her to issues surrounding Native American rights and abolitionism. Lydia’s writing continued extensively to support the couple, especially when David launched an unsuccessful attempt at sugar beet farming. His motives were true (producing an alternative to slave-produced sugarcane), but his efforts did not pay off. In the 1840s, Lydia also tried her hand at editing, working for an abolitionist paper for a short time. Although this didn’t last long, it failed to diminish her passion for the issue, which became the focus of her activities and writings during and after the Civil War. She died in 1880, having produced volumes of stories, household advice, reform tracts, poems, and essays. Hobomok: a tale of early times. Boston: Cummings, Hilliard, 1824. The rebels, or, Boston before the revolution. Boston: Cummings, Hilliard, 1825. The frugal housewife: dedicated to those who are not ashamed of economy. Boston: Carter & Hendee, 1830. The coronal: a collection of miscellaneous pieces, written at various times. Boston: Carter and Hendee, 1832. Philothea: a romance. Boston: Otis, Broaders; New York: George Dearborn, 1836. Anti-slavery catechism. Newburyport: C. Whipple, 1839. The American frugal housewife: dedicated to those who are not ashamed of economy. New York: S. S. & W. Wood, 1844, c1835. Correspondence between Lydia Maria Child, and Gov. Wise and Mrs. Mason, of Virginia. Boston: The American Anti-slavery Society, 1860. New York: S. S. & W. Wood, 1844. Fact and fiction: a collection of stories. New York: C.S. Francis ; Boston: J.H. Francis, 1846. Isaac T. Hopper: a true life. Boston, J.P. Jewett & Co.; Cleveland, O., Jewett, Proctor & Worthington; [etc., etc.] 1853. The duty of disobedience to the Fugitive Slave Act: an appeal to the legislators of Massachusetts. Boston: Published by the American Anti-slavery Society, 1860. A romance of the republic. Lexington, Ky.: University Press of Kentucky, , c1867. Looking toward sunset. From sources old and new, original and selected. Boston, Houghton, Mifflin and Co., 1883.
Letters of Lydia Maria Child. New York, Arno Press, 1969. Lydia Maria Child, selected letters, 1817-1880. Amherst: University of Massachusetts Press, 1982. Hobomok and other writings on Indians. New Brunswick, N.J.: Rutgers University Press, c1986. Over the river and through the wood. Boston: Little, Brown, c1989. An appeal in favor of that class of Americans called Africans. Amherst: University of Massachusetts Press, c1996. The frugal housewife: dedicated to those who are not ashamed of economy. Kansas City: Andrews McMeel Publishing, LLC, 2013. If you’d like read more about Lydia Maria Child, we referred to the American National Biography Online, but you can also find additional biographies from the National Women’s History Museum, the Poetry Foundation, and the National Abolition Hall of Fame and Museum. There’s also a print biography of her, The First Woman in the Republic: A Cultural Biography of Lydia Maria Child (1994) that is available in Newman Library. 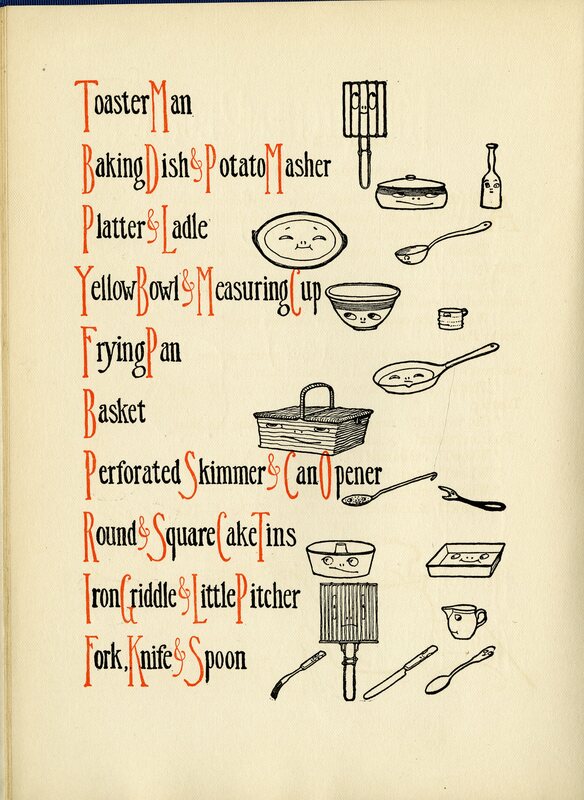 On a food related note, be sure to check out the latest post on our “In Special Collections @Virginia Tech” blog. In honor of March 17th, it’s all about St. Patrick’s Day dining! And come back next week, when we’ll talk about Hannah Glasse. This week’s feature is a quirky item. It’s not exactly culinary history related, but it’s not exactly NOT culinary history related, either. In other words, it’s tangential, but fun to talk about. It’s a trade card from a tobacco company (we’ve talked about one we have for a patent medicine before). We were interested in acquiring it for a number of connections: Virginia history, Civil War history, and advertising/culinary history. The front depicts a Union and a Confederate soldier trading items, probably while on picket duty. 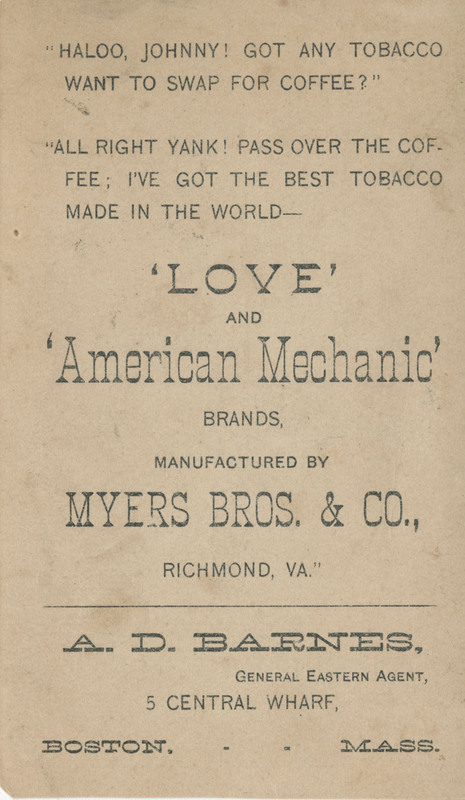 While the card was primarily designed to promote Myer Bro’s and Co. tobacco, we culinary fans have a reason to take a closer look: the “caption” on the back. It wasn’t uncommon for Union and Confederate soldiers to talk and trade across lines while on guard. We have several Civil War-era letters and diaries where soldiers mention sharing news, newspapers, and even food. Of course, they could end up in hot water if caught, but the fact that it happened regardless speaks volumes about the war. Coffee is one of those ingredients that soldiers talked and wrote about a great deal. They had it (or didn’t, but wanted it), they made it (but with the most questionable of ingredients), or they were creating substitutes for it. At times, Union blockades kept coffee out of Confederate hands (which puts the caption of our trade card in an interesting context). You can find references in plenty of the letters and diaries among our Civil War materials without having to look too far. If soldiers were lucky, they might even have sugar to go with your coffee (or whatever passed for it). We have plenty of resources relating to the Civil War and to the History of Food & Drink, as our readers well know. What might surprise you is the overlap. If you’re interested in how these two topics connect, you might think about paying us a visit. If nothing else, you’ll get to look at some amazing and unique items! In May 2012, we bought a Civil War letter–certainly not the first, nor that last. However, it was one of those rare occasions in which I had to hoard a collection to process, all for myself. You see, Sgt. William S. Tippett had something to say–quite a bit, in fact–on the subject of food. I love Civil War letters and diaries. I also love food history. So, when the two subjects meet, I’m hooked. William Tippett’s 8 page letter was written to his wife, Maggie, from a parole camp in Annapolis, MD, in March 1864.
as soon as we got on our boat [transportation to the parole camp] supper was ready, coffee meat and good wheat bread. Oh but wasn’t it good – we had seen wheat bread since November and no meat since Crismas – and no coffee since we were taken prisoners. – I thought this the best meal I ever eat in my life. Tippett’s experiences would not have been unique, as conditions for soldiers, and especially POWs, deteriorated as the war progressed. Other soldiers recount receiving moldy bread or no bread at all. Some lived on only soup and beans for months. Prisoners would share food rations, request money and food from home, and rely on just about any animal they could get their hands on to supplement limited supplies (including rats and, in one case, the pet dog of the officer in charge of the POW camp). You can see the finding aid for the William S. Tippett Letter online. Now that the letter is scanned in full, I hope to be posting it online soon, and will add links to the images and transcript in the finding aid when that is complete. If you’re interest in Civil War food history, we have a number of resources, aside from Tippett’s letter, in Special Collections, and you’re always welcome to visit. Manuscript collections here at Virginia Tech Special Collections range in size. We have collections that are more than 250 boxes (currently, our largest culinary related collection tops out around 14 containers and 7.5 cu. ft.) and many that are a single item. However, just about anything can catch your eye, regardless of size, when you work around here. Today’s feature is a Civil War-era, culinary gem we acquired just about a year ago. 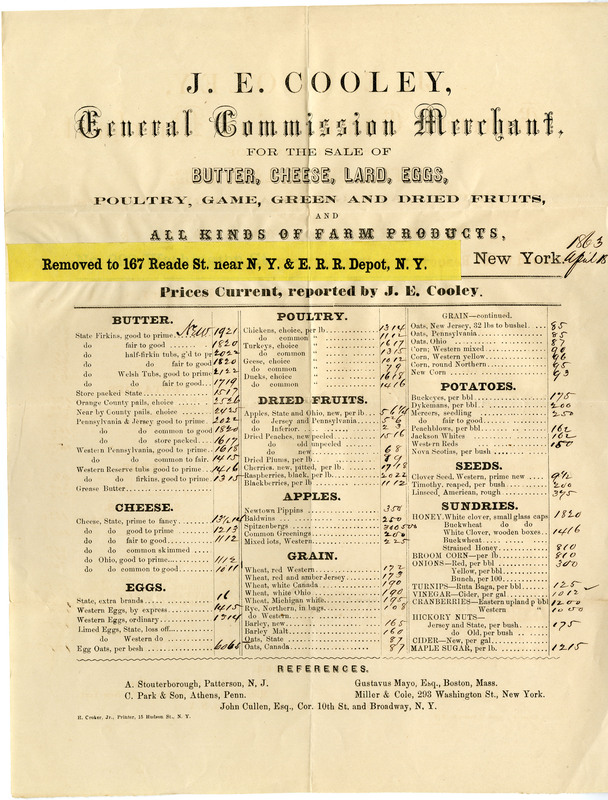 It’s a flyer for a general merchant in New York City, dated 1863. The flyer is a cool item for all kinds of reasons. First, it includes a correction (the location on yellow paper is pasted over the previous address of the business). The first site was No. 293 Washington Street, if you’re curious. And here’s a map of the approximate sites in NYC today for you geography buffs: http://goo.gl/maps/mxg9q. Second, it’s a price list and those are always fun to show what products were available in a location and where they were coming from at a given time. The business was conveniently located near both the railroad and water, which meant potential access to multiple shipping routes. New Jersey was just over the Hudson, mostly likely accounting for the New Jersey, Pennsylvania, and Ohio fruits listed. Third, this has handwritten prices during wartime. The obvious advantage to handwritten prices is that you could have a large number of lists printed and use them indefinitely…or least until a dramatic change in stock. Of course, the price of everything from food goods to medicines to household good fluctuated violently due to availability during the Civil War. If you take a closer look at the prices, there seem to be a couple of different systems in use here. Some items (butter, cheese, poultry, dried fruits, and some sundries) have a range of prices on a per unit basis, which makes sense if you don’t know how much of something you may be able to acquire and sell. Others, like the apples, grains, potatoes, and seeds, have a set price. It’s interesting to look at a list like this, then consider the content of letters, diaries, and other accounts from the same period. Some regions of the country had little to spare. 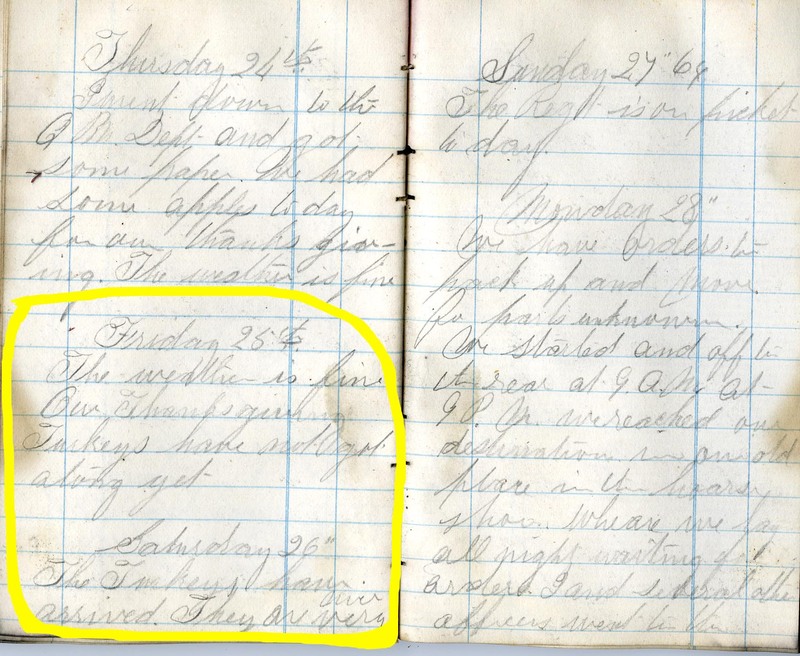 Soldiers in the field were living on limited rations, foraged plants/nuts/animals, purchased goods, and the occasional kindness of strangers; soldiers in prisons fared even worse (and both of these will make good subjects for future posts). A list that included a variety of options for apples or butter and extravagances like cheese would have almost seemed foreign. Inflation aside, we’re used to very different prices these days. A little nostalgia for the prices of a past century isn’t necessarily a bad thing. But on your next trip to the store, remember not to ask for a firkin of butter. 56 lbs requires a great deal of storage space. About two weeks ago, I was hunting through the catalog to see if we had a copy of a book up for sale. 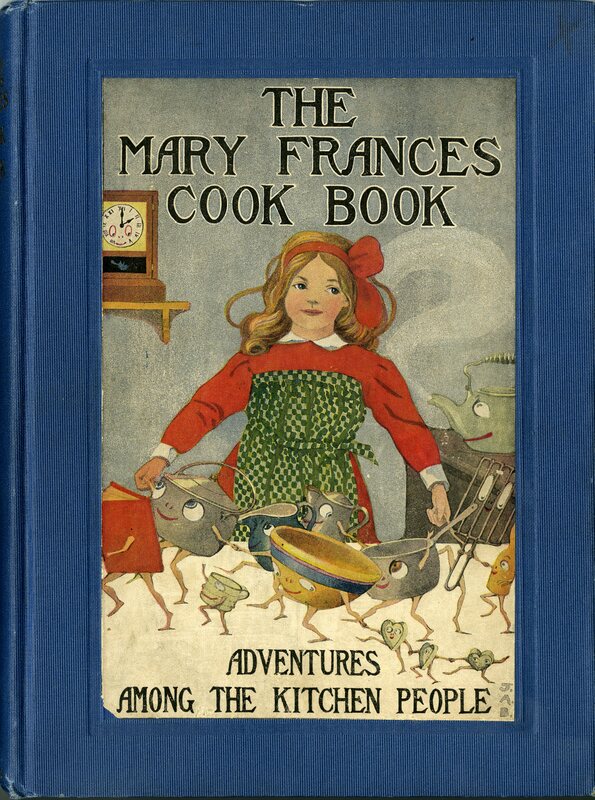 To my surprise, I turned up not only one copy of The Mary Frances Cook Book or Adventures Among the Kitchen People from 1912, but two. Even more surprising was the discovery that our two copies, printed the same year and with same text, had completely different covers and only one included a frontis piece! The first two images above are the different covers, the first done by Jane Allen Boyer and the other by Margaret G. Hays. The third image is frontis piece that only appears in copy 2. 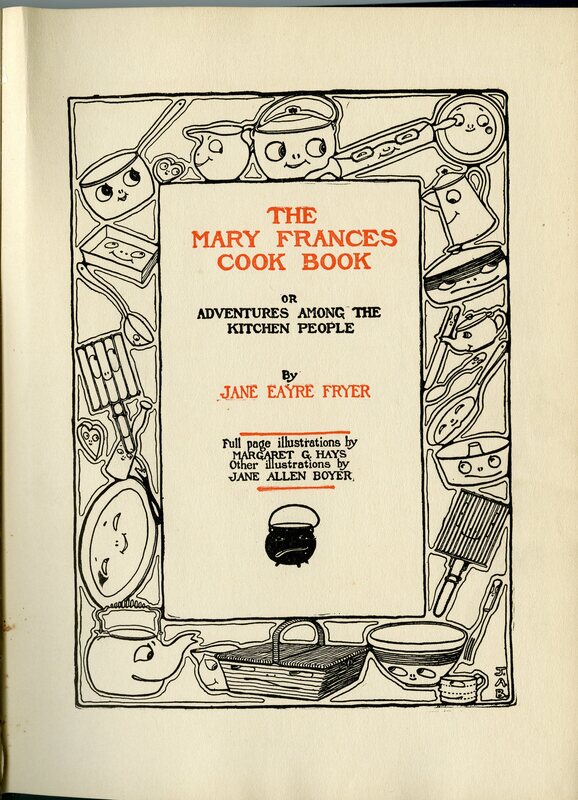 Jane Eayre Fryer’s book is a combination cookbook/storybook (more on that later) that tells the tale of Mary Frances learning to cook and bake from a book created for her by her mother, all with a little help from the pots, pans, and tools in the kitchen. When a new book or collection arrives, despite conversations with donors and booksellers, something it likely going to catch you off guard. After 3 1/2 years, I’m always making new discoveries–finding two copies of The Mary Frances Cook Book is a wonderful example. And those discoveries almost always lead to a little research. When I took the two copies from the shelf and noticed the different covers, but the same publication date, I was intrigued. I like a good Scooby-Doo style archives mystery. 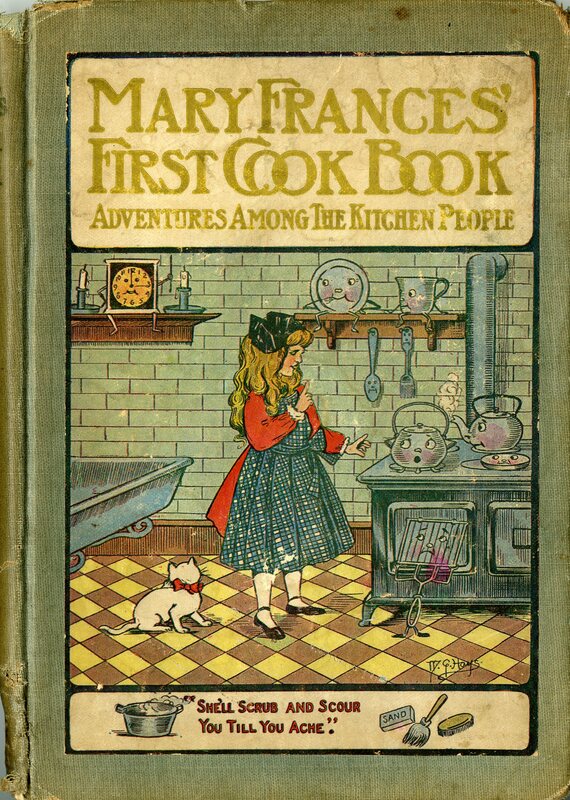 A little WorldCat searching revealed at least three different cover titles: “Mary Frances’ First Cook Book, Adventures Among the Kitchen People,” “The Mary Frances Cook Book, Adventures Among the Kitchen People,” and “Easy Steps in Cooking for Big and Little Girls, or Adventures among the Kitchen People.” This last apparently has a different title on the title page, too: Easy Steps in Cooking; or, Mary Frances Among the Kitchen People. At this point, I don’t have a solid answer, but I suspect all the variation lies in the fact that the book was privately printed in at least three locations. The involvement of two illustrators, too, could account for different cover art. And since I can’t let a mystery alone, I’ll post an update when I have one! 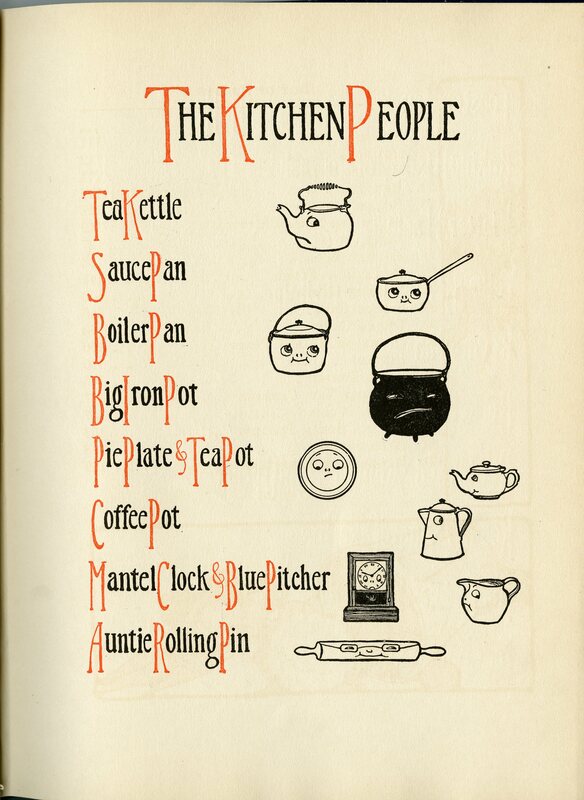 The Mary Frances Cook Book or Adventures Among the Kitchen People includes contributions from two illustrators. 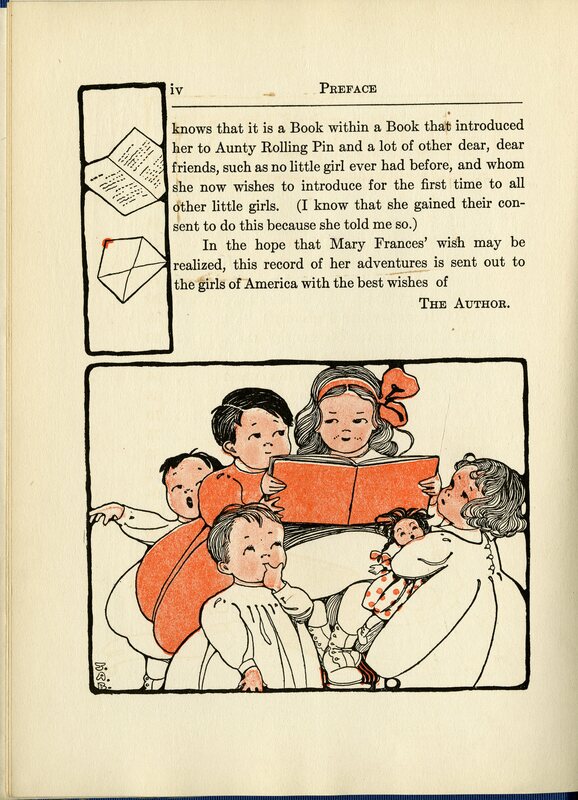 The page decorations and small images were done by Jane Allen Boyer, as was the cover from copy 2 above. 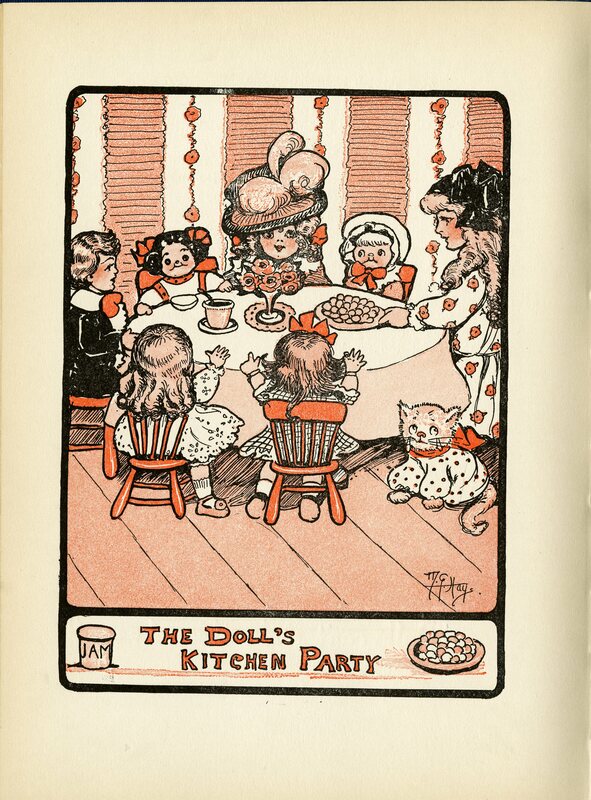 The full pages illustrations and the cover image from copy 1 above were completed by Margaret G. Hays. For our long-time followers, this name might sound familiar. 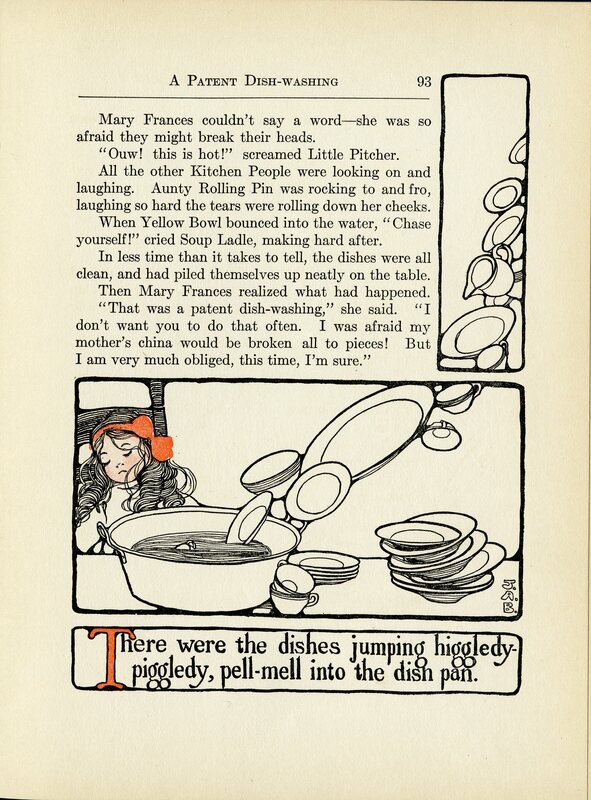 Margaret G. Hays was the author of the 1911 Vegetable Verselets, a book featured on the blog last spring that even inspired a musical event here on campus! 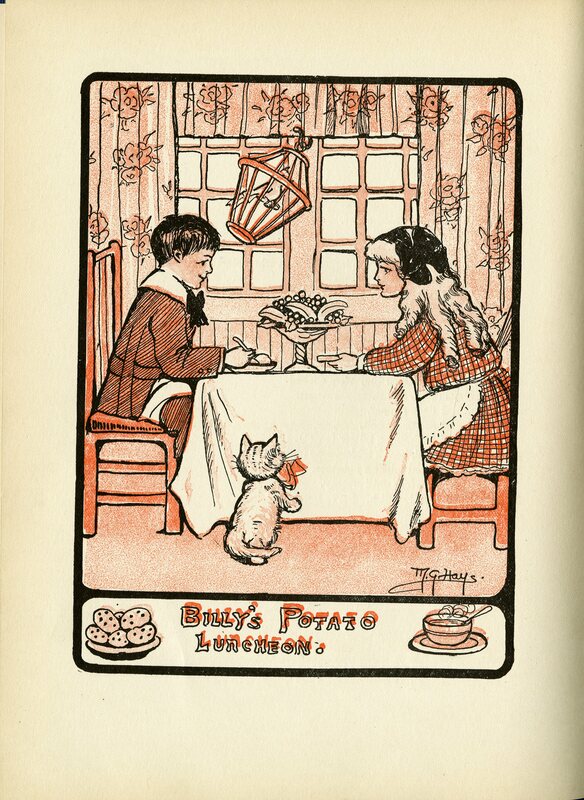 Vegetable Verselets was illustrated by Grace Wiederseim, Hays’ sister. 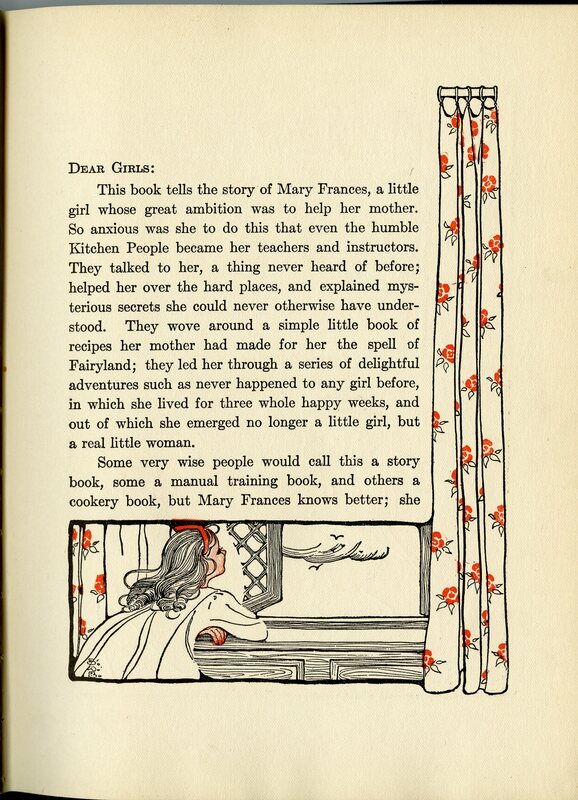 (Wiederseim’s influence on her sister’s illustrations a year later is easy to see.) Wiederseim, later Grace Drayton, was the creator of the Campbell Kids. Just a little food art trivia that makes the world a little bit smaller! On the one hand, many of the publications and manuscripts here in Special Collections are related. That’s part of the reason we collect them. Helping a researcher find papers relating to a family member four generations previous or reminding someone of their mother’s kitchen growing up because we have the same cookbook on display seem like little things that happen in the line of duty. On the other hand, I find satisfaction in the resolution of other people’s mysteries, alongside those I come across in my work processing collections. In many ways, this relates to my point above about making connections. 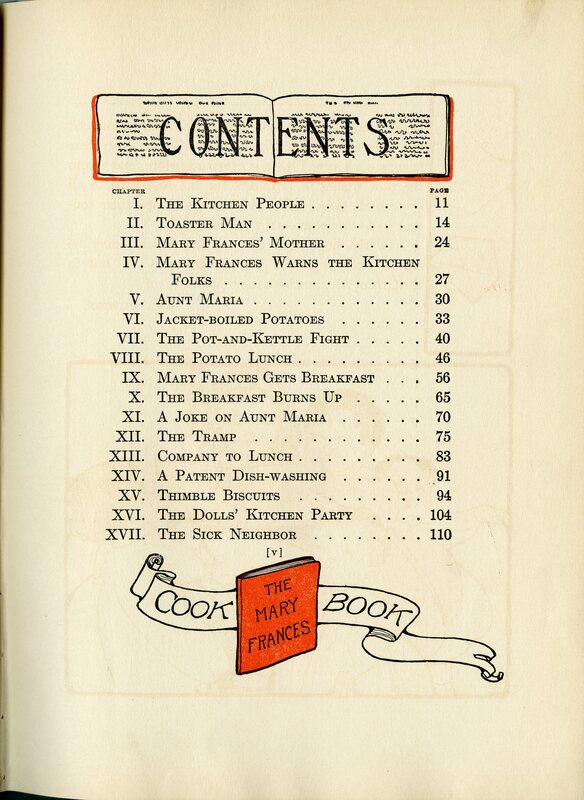 The Mary Frances Cook Book or Adventures Among the Kitchen People is a cookbook. It’s meant to be a first cookbook for young girls. In addition, it’s a storybook. 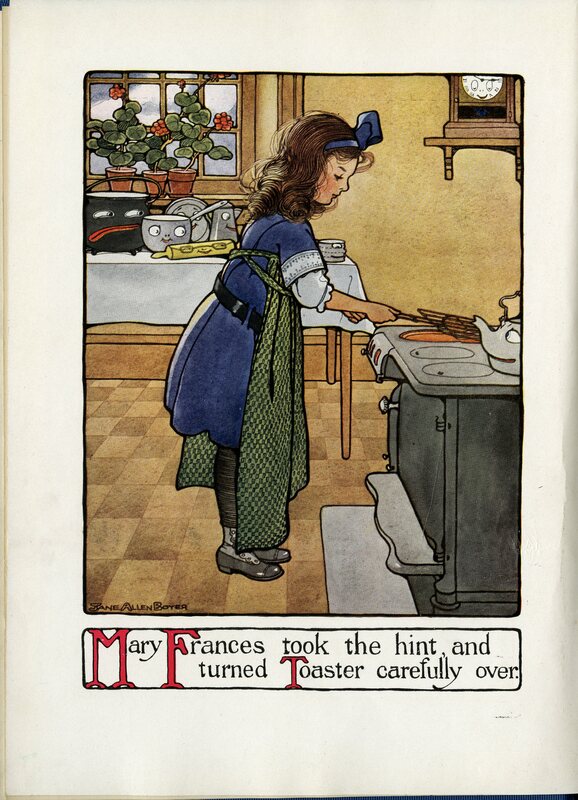 There is a clear educational narrative connecting the recipes as Mary Frances learns about the kitchen. In addition to both of these things, we might even consider this a household manual. Mary Frances is playing the substitute mother role, at least as it relates to the kitchen. 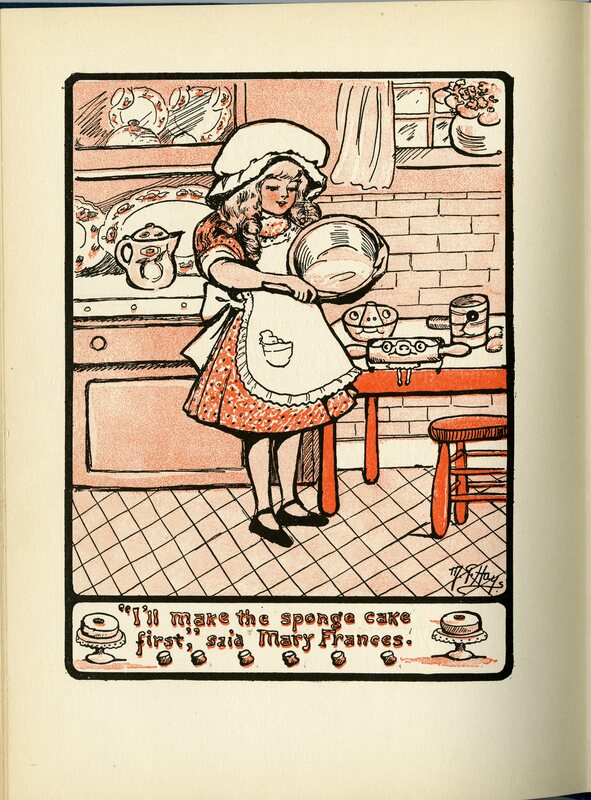 Over the course of her adventures, she learns not only how to cook and bake, but how having that role in the home relates to other (future) domestic roles. 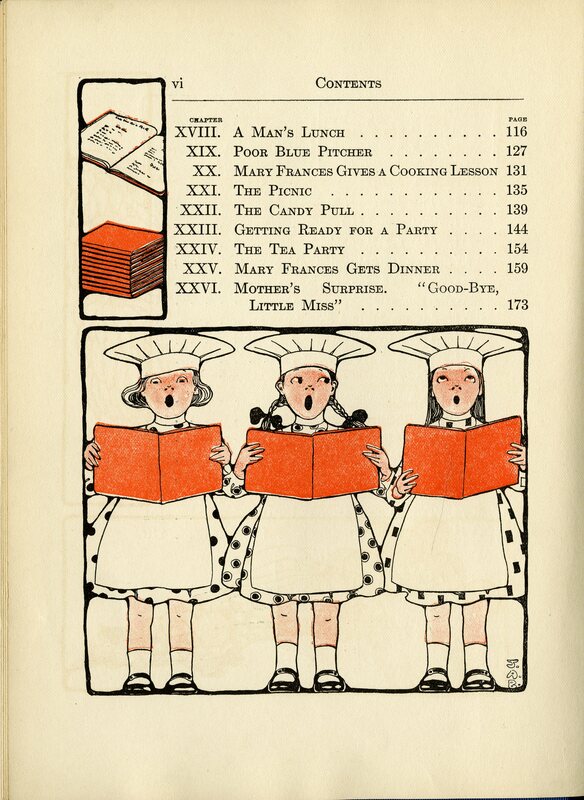 This publication doesn’t fit only into the Ann Hertzler Children’s Cookbook and Nutrition Literature Collection. It relates to topics in the larger History of Food & Drink Collection, as well. Sometimes the connections are obvious–Robert Taylor Preston’s correspondence, while usually considered part of our local history materials, relates also to the Civil War and the founding of Virginia Agricultural & Mechanical College and the university’s history. At other times, it may not be quite as clear–it isn’t until you look inside the 1960s cooperative extension publication on kitchen cabinetry that you might connect it to the International Archives of Women in Architecture, when you realize it was authored by a woman. My point to all this is that materials here never fit into a single category or collecting area, which I find to be an amazing observation. It means answering a reference question or putting together a display is never straight-forward. The more we think outside the box, the more creative an answer we can provide or exhibit we can share with all of you. I’ve created a much larger post than I expected and it in the higgledy-piggledy of last week, it’s been a bit delayed, but I should be back on schedule this week. (“Higgledy-piggledy,” one of my favorite 19th and early 20th century expressions, actually appears in our feature book, by the way!) I hope, once again, you’ll forgive my diversion. More importantly, as the one year anniversary of “What’s Cookin’ @ Special Collections? !” approaches (how time flies), I hope a post like this gives you a little insight into why I’m here, why the blog is here, and just why I love this project and my job.